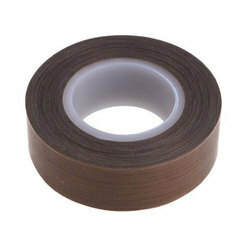 Leading Manufacturer of fiberglass adhesive tape from Ahmedabad. Well-known in the industry as an enviable manufacturer of a comprehensive range of Fiberglass Adhesive Tape. Premium-grade raw material and basic components like PTFE coated glass fabrics are used in the manufacturing process of these adhesive tapes. Knitting a wide distribution network, we are able to dispatch our range to the clients' end on-time.